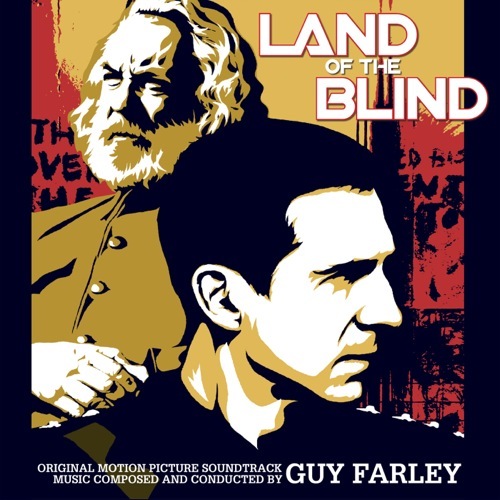 MovieScore Media proudly announces the online soundtrack release of the music from the political drama Land of the Blinddirected by Robert Edwards and starring Ralph Fiennes and Donald Sutherland. The strikingly original score for this Bauer-Martinez Studios picture is composed by Guy Farley, a British composer who is considered to be one of the most exciting and promising up and coming film composers in Europe at the moment, and Doug Edwards. Farley just finished work on the score for the Richard Gere thriller The Flock, and has previously written the beautiful music for the Andy Garcia drama Modiglianiand Mother Teresa. The original score by Guy Farley is contrasted by the music written by Doug Edwards, which results in an interesting mix of styles, where Farley’s orchestral marches and themes are effectively juxtaposed by Edwards’ ethnic influences and guitar-based ambient tracks. MovieScore Media’s producer Mikael Carlsson discovered the music of Guy Farley when he was working on one of his many articles for film music magazine Music from the Movies. Reviewing Farley’s score for Modigliani Carlsson described Farley as ”one of the most promising up and coming composers right now” and hailed his ”masterfully orchestrated” score forModigliani as ”one of the five best film scores all categories” that year. ”Naturally, I am now very proud to be able to actually release a new score by Guy Farley on my very own soundtrack label,” Mikael Carlsson comments. ”Farley is a tremendously gifted composer and I’m sure he will belong to the A list of film composers in the near future. The mix of his score and Doug Edwards songs resulted in a very creative and unusual soundtrack for Land of the Blind”. Land of the Blind was released on DVD on August 15.